“We believe that nature has given us all we need to nurture, support and heal us. the organic movement by many years and take a holistic approach to organic farming. Certified organic with NATRUE as well. I want to start with my favorite product from the collection I’ve tested. I love it so much that it definitely receives my “Highly recommended” seal! Among organic skincare brands there are several natural oil-based cleansers, which we usually use them in combination with a cotton cloth to cleanse the face. 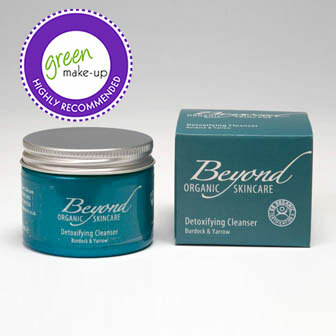 Beyond’s cleanser is this kind of cleansers, too. The main difference (in comparison with other cleansers I’ve tried) is in its formulation. I have dry skin and this winter I was also prone to some sore spots and I have to say this cleanser is really fabulous! It doesn’t just remove the impurities, but while cleansing it also nourishes your skin with organic oils from: Coconut, Gold of Pleasure oil, Sunflower, Macadamia, Sesame and Wheatgerm Oil. They have also infused the sunflower oil with burdock that has amazing healing properties for treating and soothing eczema, dermatitis and psoriasis. Because of Rosemary and other essential oils it has a fresh and slightly citrus scent. This cleanser also comes in another version which is based on Geranium and that I’d love to try as well. I use this cleanser regularly in the evening to clean impurities from my face. I find this cleanser extremely effective for removing the make-up. Because it’s loaded with so many beneficial oils, I need just a small amount in size of a peanut for the entire face. I massage gently the cleanser into my skin and then I follow twice with a damp muslin cloth (soaked in warm water). After, my skin is soft and cleansed. I love this cleanser especially for the evening because it also moisturizes well my skin and so I don’t need any other product after (except lots of toner). It can be used even in the morning, but I personally don’t prefer this type of cleansers before putting my makeup on. In every case, when using this cleanser, you will have additional benefits cause it will gently nourish your skin. According to Beyond, this cleanser promotes tissue repair and reduces inflammation, because of carefully selected plant extracts and oils. No parabens. No chemicals. No nasties. 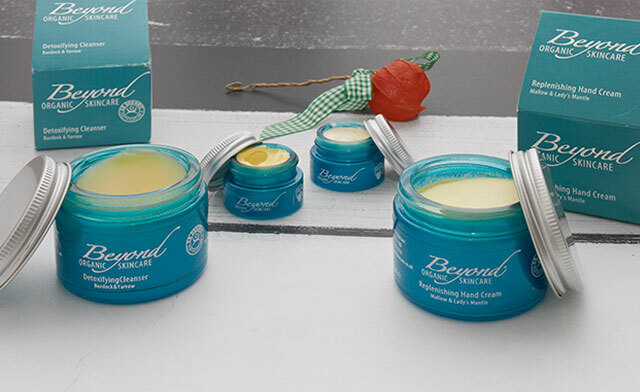 100% Organic and Natural the ideal fair trade skincare. Don’t forget that we are strictly against testing on animals and use recycled packaging with vegetable dies. For those who want to know more about Euphrasia, here is a nice link to discover more. 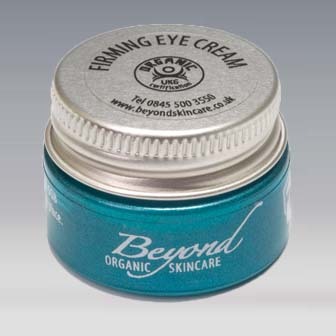 Coming back to Beyond’s eye cream, I use it both in the morning and evening and while applying any eye cream, it’s great to massage gently this area with fingers. This way you will stimulate blood and lymph circulation and reduce puffiness. Moreover, the cream will also penetrate better in the skin. I’ve also received a 7ml sample (which is very generous for a sample!) 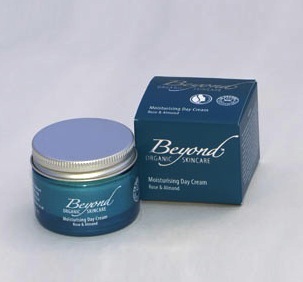 of Beyond organic moisturizing day cream. In general, it comes in a 30ml glass jar. I had used his cream for quite a long time to give an objective opinion and it also lasted for quite a long time. The texture of this cream is very silky, nourishing, but not so dense. I’d say a medium texture: not too light and not too dense. A perfect formulation for a day cream which I’d suggest to all skin types. While I was using this cream, the weather was very cold and my skin was very dry, so I knew the cream wasn’t enough. But as I said, the conditions were quite extreme. In general, this cream is great to wear as a make-up base, especially under mineral make-up. It leaves a non greasy healthy glow, some kind of radiance to the skin. I’d define it the perfect day cream for normal to dry skin. When you look at the list with ingredients you will notice again that the base is Rose hydrolat, many vegetable oils that nourish the skin like: Macadamia, sunflower, Seabuckthorn and others. That means it is great for dry skin (in normal weather conditions:) as well. The amount of “organic” & “natural” hair & skincare out there can be overwhelming, especially when you are first making the transition over from the more commercial brands. This is exactly why I love reading reviews like yours, especially since the products you’ve mentioned are certified organic! My go-to for natural & organic products is Purelement Naturals. If you’re interested in trying out new products, I would definitely suggest checking this company out. My favorites are Defend Moisturizer (a blend of argan oil and essential oils) and “Glow” – a great, natural scrub! Like you, my skin used to be dry in the winter – but I am extremely impress with how much oil based products have improved my skin. My skin has been more hydrated and softer than ever before!